As we are gearing up for Rock n Roll Las Vegas ( which is a night race), we decided that we wanted to revamp our play list to add more "night" time songs. You know there are certain songs that just give you that Night time vibe? 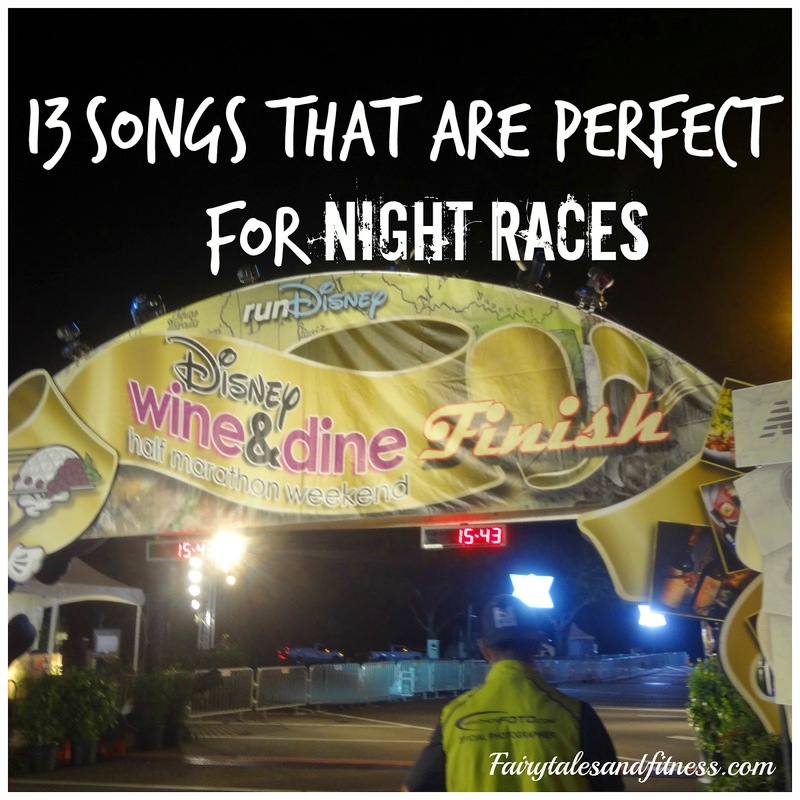 Since many runners are heading to Disney's Wine n Dine this week ( which is also a night race), we thought maybe they would appreciate these suggestions too. So whether you are running Vegas, Wine n Dine, the new Surfin Santa night race, or any other night race, be sure to check out some of these tunes. You might just want to add a few to your play list. Good luck to everyone running Wine n Dine or any other upcoming Night Race! What other "Night" songs would you add to our list? Yes, that is a good one. I like Madonna so I don't know why I didn't think of that one! Great suggestions! I need to update my playlist, and some of these will definitely be added! Yea, some of these songs are so motivating. Definitely great suggestions! I don't have another night race on my radar for a while but I'm thinking I might do Wine & Dine next year so I'm sure it will come in helpful then if not before. I am bad about keeping my playlist the same. However, I will check out some of these listed! I use to be like that too. I still have some songs on my playlist that I cant stand anymore but for some reason I cant seem to remove them. I think I have, but then they are still there! My RENThead's coming out and I'd add "Out Tonight"
Never heard of those. I'll have to check them out. That's the one we'll be doing in a few days! Any song that makes me want to party also makes me want to run... so I could say any of those songs make me wanna run at night ;) I think Timber - Ke$ha and Shake Señora - Pitbull are good because of the beat.. it's enough to motivate you late at night! Yes, we both actually have that song on our playlist too! Is it motivating you to work? Some rock classics, Joe Walsh "All night long"...heck Lionel's song too with the same title, Saturday Night's All Right For Fighting by Sir Elton, Van Halen's Dance The Night Away, and for totally bop fun Summer Nights from Grease! Great post, I love my running songs! I went through a patch where I didn't listen to music either but I find that my running is better when I do. Love it! Your going to have a fun race that is for sure! Thank you! We are really looking forward to it. Only a few more days! Thank you Mary Beth. I hope your friends have a great time too! I think I have most of those songs on my iPod. Great choices! Some of these songs are hard not to like! Thanks. There are so many great songs but we just narrowed it down to 13! Love this, some new ones in there for me!! I love this playlist! That's a great mix of songs....makes me miss making playlists like I did on my CD's back in the day! Runner Stuff I'm Loving and My Birthday!